The great microwork debate is highly contentious – it’s both a catalyst for employment creation and a mechanism for exploitation. It’s ‘a race to the bottom’ but also a pivotal means for un- and under-employed individuals to enter previously inaccessible labour markets in rich countries. It defies geographical constraints but, conversely, exacerbates geographical biases. As more people gain connectivity, the call for greater regulation in the microwork space grows more urgent. So, what’s the best way to enforce this in a way that helps rather than hinders the people it is meant to protect? 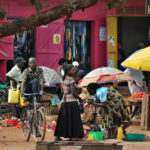 Do people in the Global South get jobs online? Q: Some people find paid jobs or tasks by connecting directly with people who want to hire them using a website or mobile app. In the last year, have you earned money by taking on jobs of this type? AfterAccess asked if people had ever found paid jobs/work/tasks by connecting with buyers online. In some countries, such as Colombia, Mozambique, a high percentage of people said yes. In India, only 4% of the population said yes, but given the 1 billion-plus population, this is a large absolute number, albeit the low percentage. The Oxford Internet Institute calculates (using automated scripts) the number of workers active on four large online microwork/freelancing sites. Their numbers show that outside of the United States, India, Pakistan and Philippines are the largest providers of such labour. What kind of jobs do people get online? Very small jobs, called microwork: Examples can include clicking repeatedly on ads in order to increase the view numbers; tagging images; reading scanned text and typing it out. Each job is of extremely low value (under USD 0.01, for example), but workers often do a large quantity in order to earn money. Each activity lasts a few seconds. These jobs require very low levels of skill other than basic computer literacy, and tools (an Internet connection and a computer/phone). We found many workers make their entry into digital work through these types of jobs. It is not rewarding, and many give up after some time since it is difficult to earn substantial amounts of money. Medium sized jobs: Jobs that typically pay USD 5-10 per task, and include work such as designing logos, writing content (paragraphs for some web site on a given topic). These jobs require a higher level of skill (for example, basic graphic design software training, usually acquired in a 3-month diploma course; good English or other language writing skills in order to write content). These jobs are highly competitive as more and more people work for lower and lower pay. Large jobs, or “projects”: These are typically done over multiple days or weeks. Work includes design of websites and integration of payment engines to existing or new websites. The skill level required is higher (computer coding, for example), and pays significantly better (in Sri Lanka, for example, LIRNEasia saw average weekly incomes of USD 140). These jobs are slightly less price sensitive, and the workers have a little bit more negotiating power. At times, the buyer and seller have repeated interactions (doing multiple projects), and at times they move their relationship offline – that is, the buyer directly reaches out to the seller and contracts them directly for subsequent projects. Broadly, these jobs are characterized by “gig” work where there are no long-term contracts, work takes a finite amount of time and a large task could be divided into multiple parts and completed by multiple people who don’t know each other and are located in diverse geographic locations. Much of these jobs are conducted remotely, end-to-end: the buyer and seller never meet or have to meet. They find each other online, the work is done and delivered remotely, and payments are made remotely – all mediated through an app/the Internet. How well do people earn, from jobs they get online? There is a large variation in what people get paid. 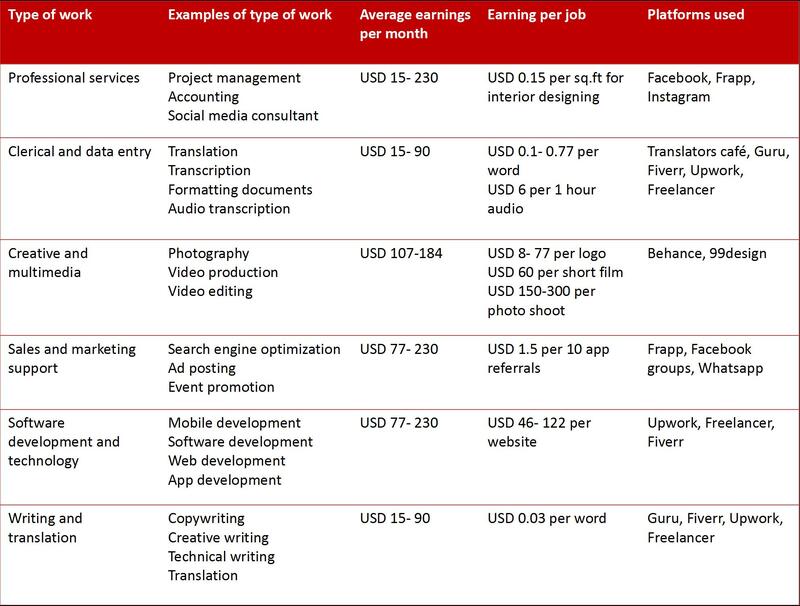 For example, LIRNEasia’s qualitative study in India (which included over 300 respondents) found that software development and creative multimedia (both requiring some level of skill beyond basic literacy or digital literacy) are the highest paid. Source: LIRNEasia, interviews with over 300 respondents. The good, the bad and the opportunities. Microwork provides an opportunity for job seekers to overcome geographical boundaries and access international labour markets at lower costs. This should equate to improved income-earning opportunities for some of the world’s poorest populations. This additional income is critical to many households around the world; for example, most South Africans and Tanzanians who participate in microwork cite the extra income as ‘essential.’ Wealthier households contribute to a healthier economy. It improves matching opportunities and labour market efficiencies, often providing a solution to under-employment; additionally, it can better the employment prospects of globally marginalised groups, like women and young people without formal qualifications. Budding entrepreneurs can also take advantage of microwork as a means to become intermediaries who take on jobs then outsource these to other micro-workers, keeping a significant percentage of the pay whilst doing less of the work. This is a highly competitive market, and a global one. 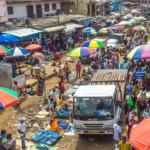 Frequently described as a ‘global race to the bottom’, microwork creates a competitive space which forces workers to take on all the risk, with minimal rights and extremely low pay – well below minimum wage in many countries. 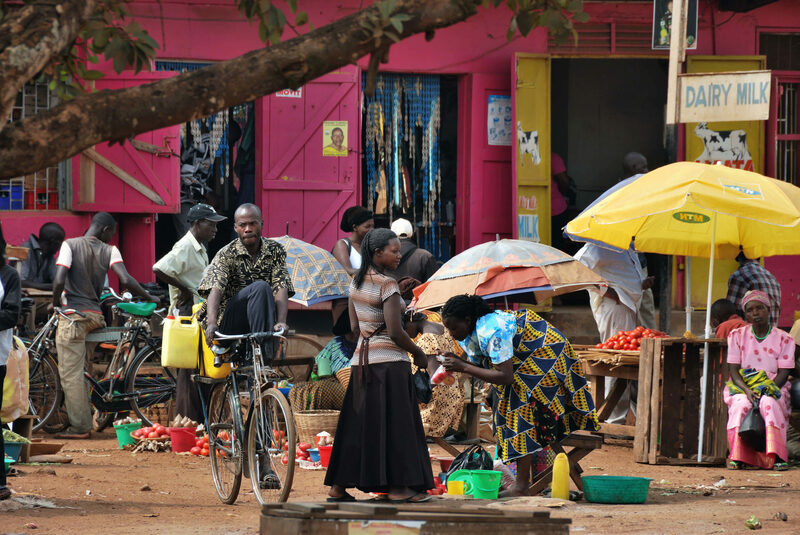 Arguably, it exploits the world’s poorest – and most desperate – populations. It can exacerbate existing inequalities – for example, there is a huge gap between those with 5G connectivity and those with barely any connectivity at all. Online work also highlights the issue of ICT literacy – basic skills are required to perform any microtask. 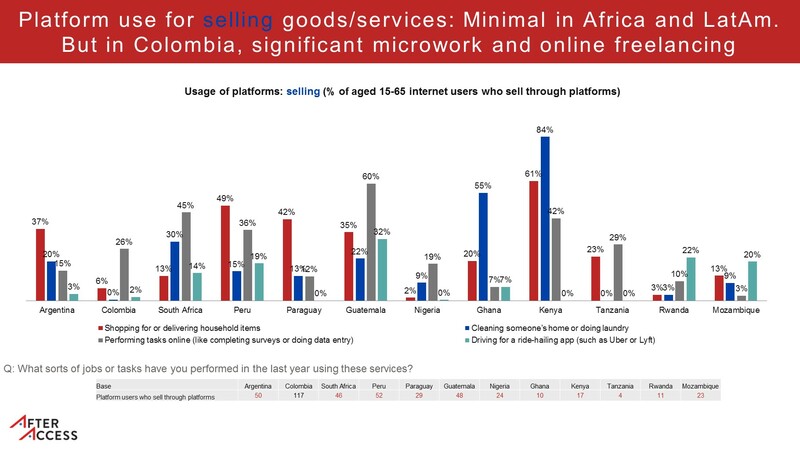 In seven African countries surveyed by AfterAccess only 28.43% of people had internet connectivity – and of these, only 7% participated in microwork. Country biases also still exist – many employers still favour workers from their own countries. Power relations between employers and workers are unbalanced. Workers have very little protection in terms of job security and minimum wage. The work provides them neither benefits nor health insurance. In addition, it is difficult to organise transnational worker’s unions and activist movements that have any real sway. Globally, microwork catalyses a lack of transparency, allowing for large pay discrepancies, for potential tax evasion, and for intermediaries to take advantage of the workers they delegate jobs to. Many have to do a lot of “hidden work”: Constantly monitor the app/websites for new jobs, for example. “Wage theft” is not unheard of – that is, the work is done and delivered, but the buyer refuses to pay, for frivolous reasons. There is little recourse for the workers on most platforms – they can’t complain about the buyers, they can’t rate buyers, and so on. The platforms are designed mostly to accommodate buyers, not workers. Responsible platforms can do much to improve working conditions. In fact, they should take action before regulators decide to. Making the rules of the platform clear would help workers understand how they get “rated” on platforms. Enabling the workers to rank buyers may limit wage theft and other unethical behaviour by buyers. A process (e.g. : ability to appeal; an “ombudsperson”) where workers can seek recourse when faced with unscrupulous buyers, will improve working conditions. Download the infographic here .